I hope each and everyone of you had a great weekend and those of you celebrating July 4th had a great one as well. We had a lovely weekend that was spent with friends who visited us from D.C., it was really, really nice to see familiar faces. I'm not missing the hustle and bustle of D.C. but I do miss my friends a little. We visited a few vineyards in Sonoma valley which was a fun trip. Cherry season is one of my favorite things to look to every summer but sadly it is also one of the shortest. So this week, I'm going to share two easy recipes back to back, that use cherries and I hope you like them. We've been getting tons sweet cherries here at the farmer's markets in California, so of course, yours truly has been partaking in eating copious amounts of these sweet little red bubbles of joy. The first recipe this week is this delightful cherry pie that has a little kick of ginger in it. 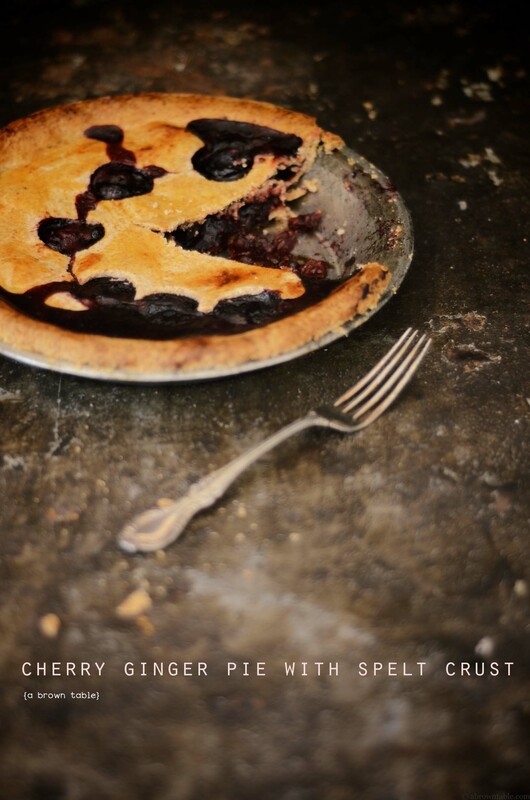 When I started out to develop this recipe, I wanted a pie with relatively little added sugar or sweeteners of any kind, this way I wouldn't feel too guilty when I ate the pie and you could taste the tart and sweet flavors of the cherries in the pie. 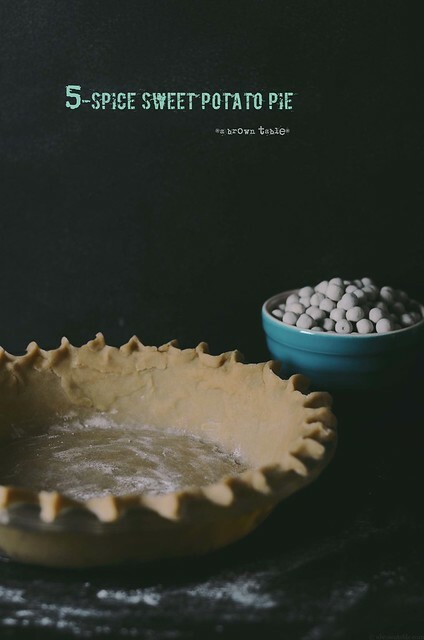 Different people have different salt and sugar taste sensitivities, so what I will recommend that if you like this pie on the sweeter side, taste the pie filling while making it and then add a teaspoon or two of sugar. I love the texture of crystallized bits of ginger in baked goods, so I've bumped up the notch here by adding a little. You can leave the ginger bits out too, the gingers bits are crystallized in sugar so they do sweeten the cherry filling a little. I used my previous spelt crust recipe for this pie. This pie crust is very forgiving if it cracks during assembly, all you need to do is pressed the cracked ends together. Also, if you don't want to use my pie crust recipe you can use your own or your favorite pre-made pie crust. Feel free to style the pie pastry as creatively as you want, just make sure you create enough holes or slits to allow the pie to ventilate. Cherries are very juicy and will release a lot of moisture and steam during baking. 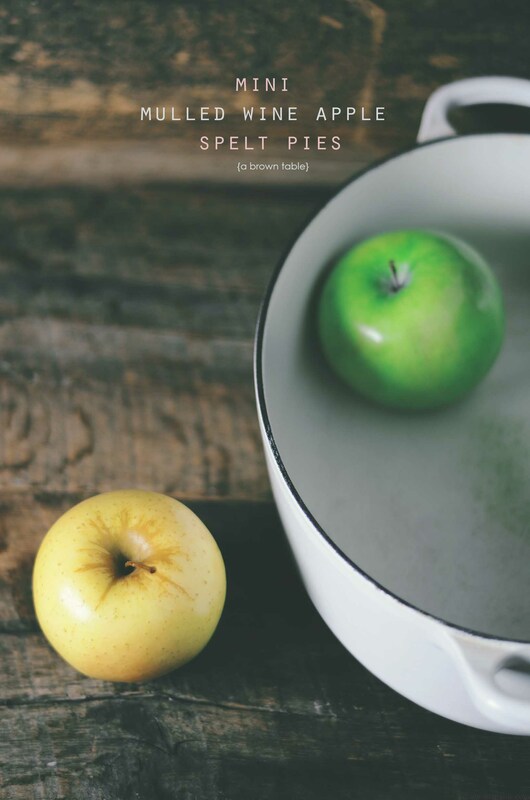 Pies are such a delightful treat to bake, they are rustic and remind me of busy kitchens with wooden stoves on old farms. 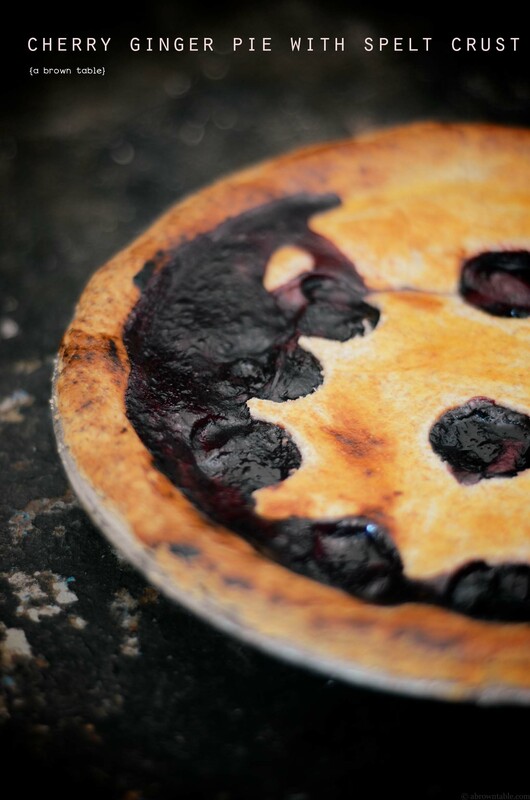 I think a pie should be as messy as can be, dripping with all the delicious flavors that it holds that entice you. So go ahead enjoy cherry season and make some pie! 1. Wash and drain the cherries in a colander. Pit the cherries and discard the pits. Place half of the cherries in a thick bottomed saucepan with the ginger, crystallized ginger bits, *sugar (optional) and lime juice. Heat the contents on a medium-high flame and bring to a boil. Reduce the flame to a gentle simmer, cover with a lid and stir occasionally. Cook for 5-6 minutes until the cherries have become soft and mushy. Remove the contents of the saucepan and puree in a blender, food processor or with an immersion blender until smooth. Return the puree back to the saucepan. 2. Add the vanilla and salt to the puree and bring the contents of the saucepan back to a boil on a medium-high flame. Whisk the cornstarch and the water in a small bowl and quickly mix into the puree. Stir until the puree thickens, this should take about a minute. 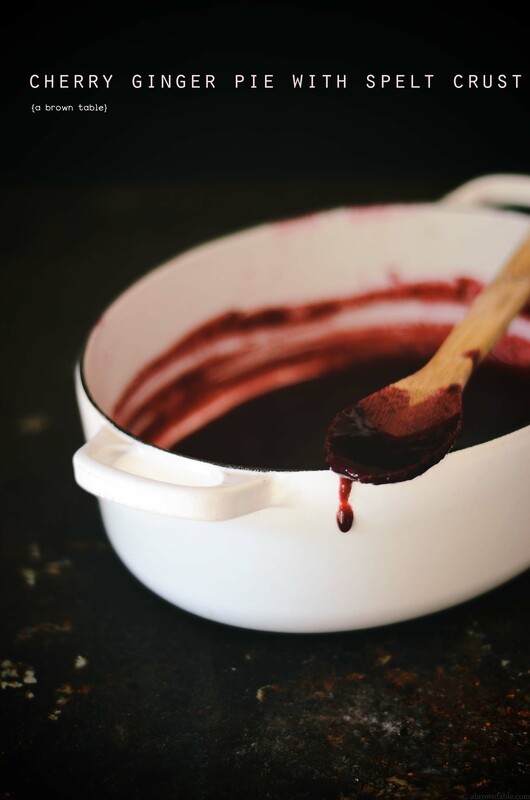 Remove the saucepan from the stove and carefully fold the rest of the cherries into the puree. Cover the saucepan with a lid and allow it to sit for 30 minutes. Keep aside until ready to use. Note: This pie filling can be prepared the day ahead and then refrigerated until ready to use. 1. Perform step1 to prepare the dough. Divide the dough into two equal parts, wrap with cling film and chill until ready to use. 2. Place a wire rack in the center of the oven and preheat to 400F. 3. Roll out one disc of dough and line a 9 inch pie pan with it. Pour the cherry pie filling prepared earlier into the prepared pie pan lined with the pastry dough. 4. Roll out the second disc of pastry and cut out circles using the wider end of icing tip or a circular biscuit cutter (you can even use a small cookie cutter to make the holes extra special such as stars). Place the second sheet of pastry over the prepared pie and press the edges together and seal. Whisk the egg yolk with the water in a small bowl. Brush the surface of the pie with the egg yolk mixture. 5. Bake the pie in the oven for about 25-30 minutes until the crust turns golden brown. Reduce oven temperature to 350F and bake for another 35-40 minutes until the juices begin to bubble and the crust becomes a deep golden brown. Remove the pie from the oven and allow to cool for at least 2 hours on a wire rack before serving. In "Baking", "Dessert", "Ginger", "cherries", "cherry", "pie", "spelt"
Christmas involves a lot of baking at our home and I find myself trying out old and new techniques each year and developing new flavors that will make my holiday menu extra special. This year however, I am not hosting a dinner since we are traveling and the cooking requirements are significantly reduced. A week from now, we will be celebrating the holidays in California, it's a welcome change that we both need and a nice break from the cold and gloomy days here in D.C. Plus, I get to meet up with my family and friends and eating a whole lot of food on this trip! However, what would Christmas be without baking a few holiday desserts and cookies! Apple pies are something I make every holiday season but this year, I've been working on a special type of crust, one that is wholegrain yet flaky and delicious but without the shortening. You will love this spelt crust, it is easy to prepare and work with and when it comes out of the oven you will want to grab a hot pie straight off the baking sheet. There's something comforting in eating a soft flaky pie crust, especially in cold weather. I've used coconut oil as a substitute for the shortening which works wonderfully in the dough. I used one of the tricks from Cook's Illustrated America's Test Kitchen to inhibit gluten formation in the dough by using a splash of vodka. This apple pie filling represents some of my favorite holiday flavors that are absolutely wonderful! It has a mix of Golden Delicious and Granny Smith apples that are cooked with red wine and sweet ginger bits. And best of all you can add whatever mix of mulling spices that you love to flavor the wine. You probably won't end up using all the liquid to fill the pies so do what I did, save it as a sauce to pour over your breakfast pancakes or serve it as a sauce with some fresh fruit like pears for desserts! 1. Pour the wine into a thick bottomed saucepan. Place the mulling spices into a muslin cloth bag or a piece of cheese cloth and tie it at the open end with a piece of kitchen string. Add the bag to the wine and bring the wine to a boil on a medium high flame, reduce to a gentle simmer and allow the wine to cook for 20 minutes or until it has reduced to 1/2 of its original volume. 2. Add the sugar, honey, apples, and ginger bits to the wine. Cook for another 30 minutes on a medium low flame until the apples are tender. The apples will release their liquid. Remove the muslin bag with the spices and discard. 3. Remove the mulled wine apple pie filling and allow it to cool to room temperature before using it to fill the pies. 1. Pulse the flours, sugar and salt in a food processor for a few seconds to mix the dry ingredients. Randomly distribute the chopped butter and coconut oil over the dry ingredients. Pulse the ingredients twice for 30 seconds to mix the fat. Continue to pulse the ingredients and slowly drizzle the vodka and water into the food processor. Continue to pulse until the ingredients come together to form the pie dough. Remove the dough from the food processor, roll it out onto a lightly floured surface and divide it into 4 flat discs. Cover each with cling film and refrigerate for 1 hour before use. 2. Remove and unwrap one disc. 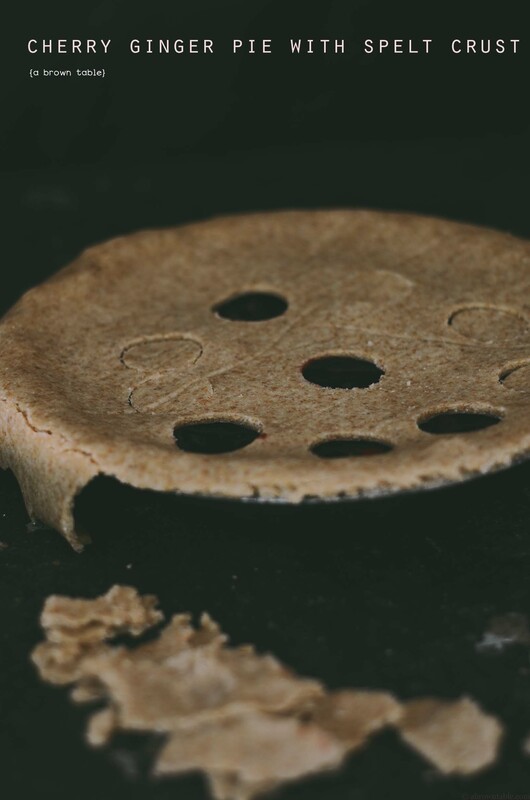 Place the disc on a lightly floured surface and using a rolling pin flatten the disc out to a rough 12 inch circle. Cut 4 inch circles and place the circles on baking sheets lined with parchment paper. Repeat with the remaining three pieces of dough. Any extra bits of unused dough can be combined, chilled and reused. You should get a total of 16 circles of pie pastry. 3. 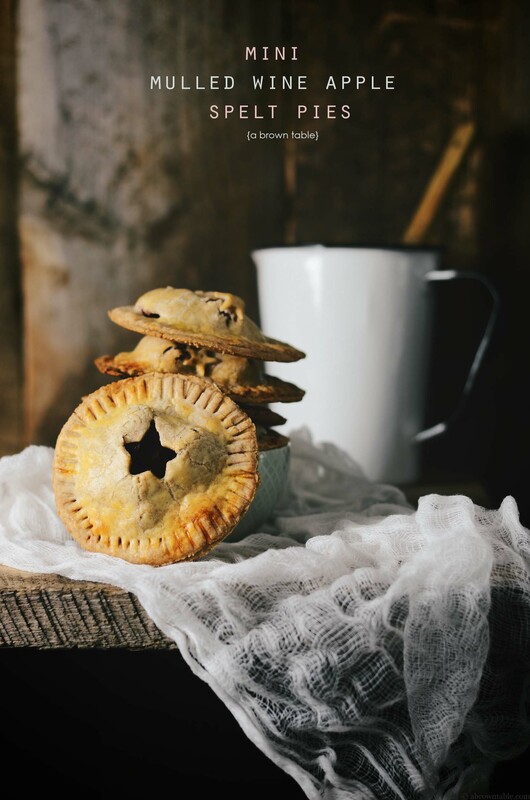 Using a small star-shaped cookie cutter (you can use any shape of cookie cutter here) cut out a star in the center of 8 of the 16 circles of pie pastry cut out earlier. Reserve the stars and keep aside these discs aside. 4. Place 1 generous tablespoon of the apple filling in the center of an uncut pie circle. Place and center one of the cut circles over the filling and seal the edges of the two discs by pressing lightly with the prongs of a fork. Repeat and prepare the rest of the pies. 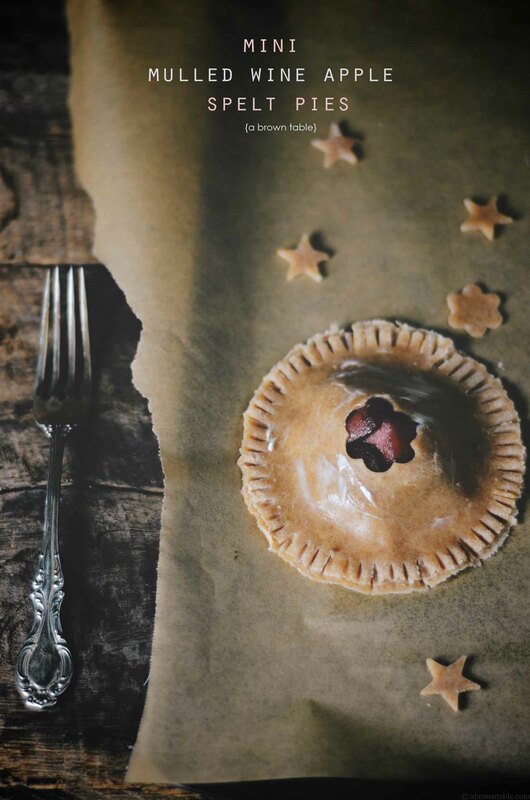 You can decorate the pies with the reserved cutout stars as you like. Chill the pies on baking sheets lined with parchment paper for 30 minutes before baking. 5. Preheat the oven to 350F and place a rack in the middle of the oven. Lightly whisk the egg yolk and water in a small bowl. Brush the surface of each pie with the yolk wash. Bake the pies for 25-30 minutes until the crusts are golden brown. Allow the pies to cool on the baking sheet for 10 minutes and serve warm. 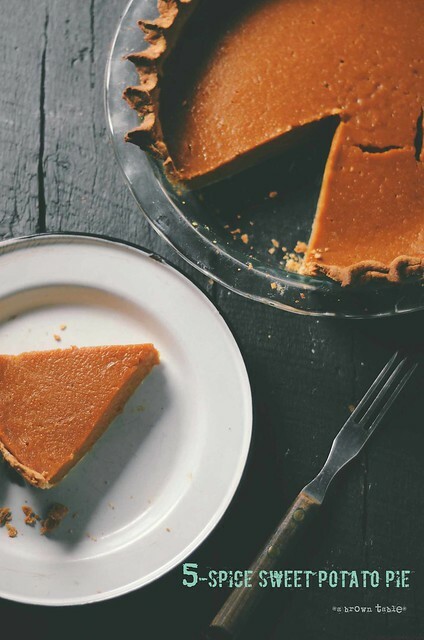 In "Apples", "Baking", "Fruit", "apple pies", "mulled wine", "pastry", "pie", "spelt flour"
If there's one dessert that I look forward to every Thanksgiving, it is the sweet potato pie. 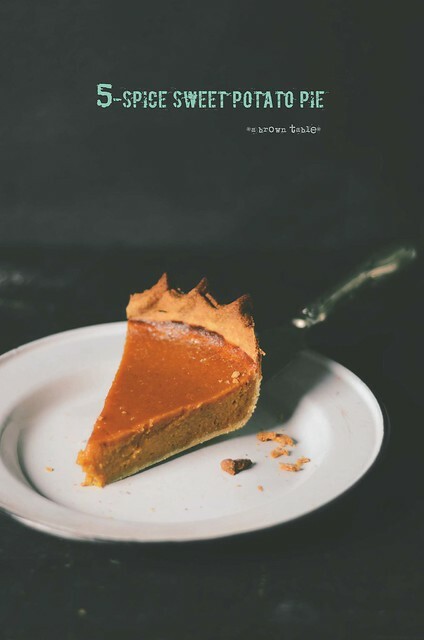 Over time, I've learned to equate sweet potato pie with comfort food because of its simplicity yet complex delicious flavors that with every bite invokes a pleasurable experience that reminds me of all the great seasonal flavors that come with fall weather. 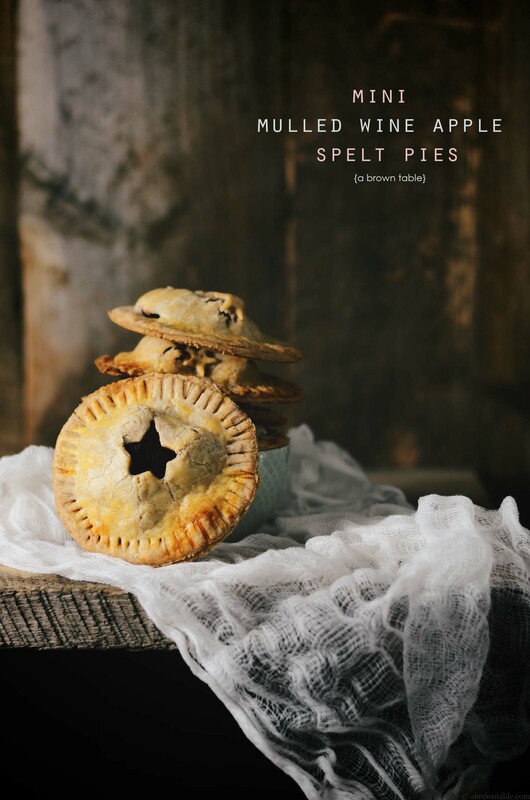 It should come as no surprise that with the Thanksgiving holidays right around the corner, I am sharing my favorite pie recipe with you. This filling is special, it has a mix of Chinese 5-spice powder and ginger to give it that extra boost of flavor that you will fall in love with. Chinese 5-spice powder is a blend of fennel, star anise, cloves, cinnamon and sichuan peppers, that's a great mix to have in stock at all times in your kitchen pantry. 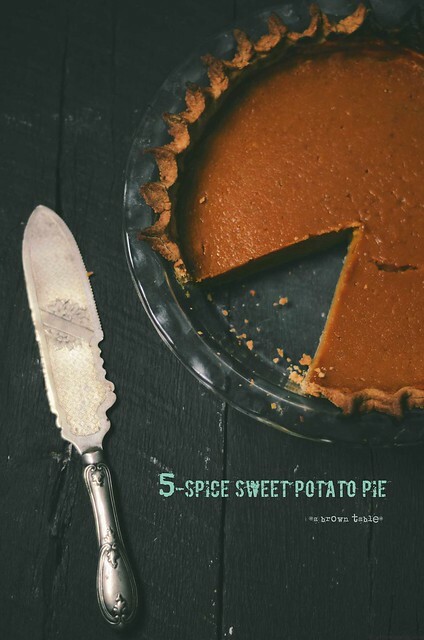 Imagine yourself whisking all those delicious aromatic spices into the sweet potato, warm whiskey with vanilla and ginger and then the sprinkling of the 5-spice powder, followed by the molasses. That, in my opinion, are fall comfort flavors at their best! One feature that I always look for in a pie crust is the flaky and light texture that sets it apart from other pastries. This crust uses whole-wheat pastry flour and a little bit of vodka to create that flaky texture but yet it provides the goodness of whole-grain. Both the pie and the filling have a little bit of alcohol but the alcohol evaporates during baking and there are no traces left, so this is not one of my usual boozy recipes. Another reason why I like using this pastry dough recipe to create the crust is its forgiving nature when it comes to lining the pie pan, you can glue and seal any cracks with any left over bits of unused dough. However, since the dough is rather moist it does absorb and take up a lot of flour during the rolling out process. I normally make the dough the night before and line my pie pan and then bake it the next day with the filling. Another tip, if the dough starts to get too sticky and warm, stick it back in the refrigerator and then work with it. As far as possible avoid using your hands to touch it too much, a pastry scraper works wonders here. The sweet potato puree here is really simple to make. I normally bake a couple of sweet potatoes in their jackets for 40-45 minutes at 350F. Once they are cooled, I peel and discard the skin, I think process the flesh of the tuber in a food processor to get a smooth puree. I like to eat this pie warm or cold and sometimes with a little bit of creme fraiche on the side that's been lightly sweetened and whipped. 1. Pulse the flour, sugar and salt in a food processor until completely combined. 2. Drop the chilled butter pieces into the processor and pulse until evenly distributed and combined. You might need to occasionally rub the sides of the processor down to allow the butter to combine with all the dry ingredients. 3. Transfer the contents to a large mixing bowl (preferably chilled) and sprinkle the vodka and water over the flour. Fold and bring the dough together to form one large ball, using a silicone spatula. 4. Cover the dough with cling film and refrigerate for one hour before use. 5. Remove the chilled dough from the refrigerator and allow it to sit on the counter for 10 minutes. 6. Preheat the oven to 350F and place a rack in the center over the oven. 7. Roll out the dough into a 12" circle and carefully transfer over a pie pan. Gently press the dough to fit the pan and trim off any excess dough that is hanging over the edges. With your fingers, crimp the edges of the pastry. Cover the pastry with loosely with cling film and refrigerate for 15 minutes. 8. Just before baking the pie, line the edges of the pastry with aluminum foil. 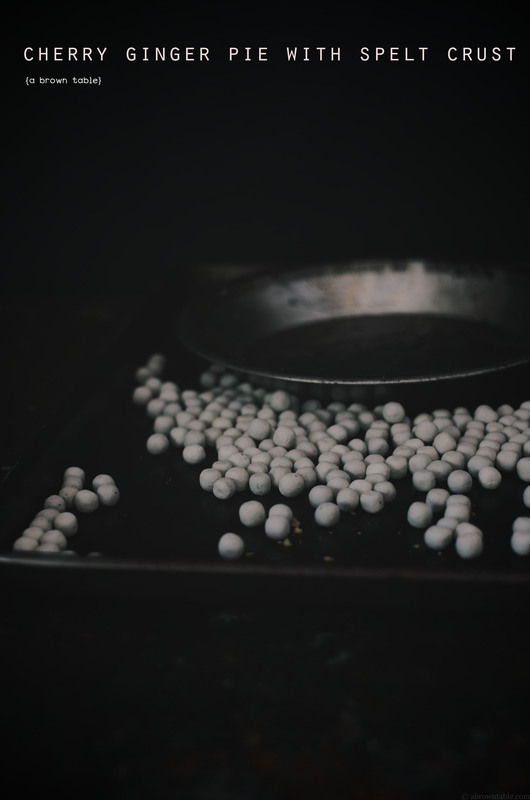 Place a piece of parchment paper (cut to size) in the center of the pan and place the pie beads/weights/chain/ dried beans. Bake the shell for 15 minutes. 9. Remove and discard the aluminum foil. Then lift the pie beads out using the parchment paper. 10. For the sweet potato filling and final pie preparation read instructions below. 1. In a large mixing bowl, whisk all the ingredients together to form a smooth mixture. The sugar should be completely dissolved. 2. Transfer the filing into the partially baked pie crust, tap gently to level the filling and to remove any trapped air bubbles. Return the pie to the oven and bake for another 35-40 minutes or until the sides of the pie are firm and the center is slightly soft (The center should jiggle slightly when the pie is gently shaken). Remove and allow to cool to room temperature. The pie can be served warm by itself or with a dollop of lightly whipped sweetened creme fraiche. 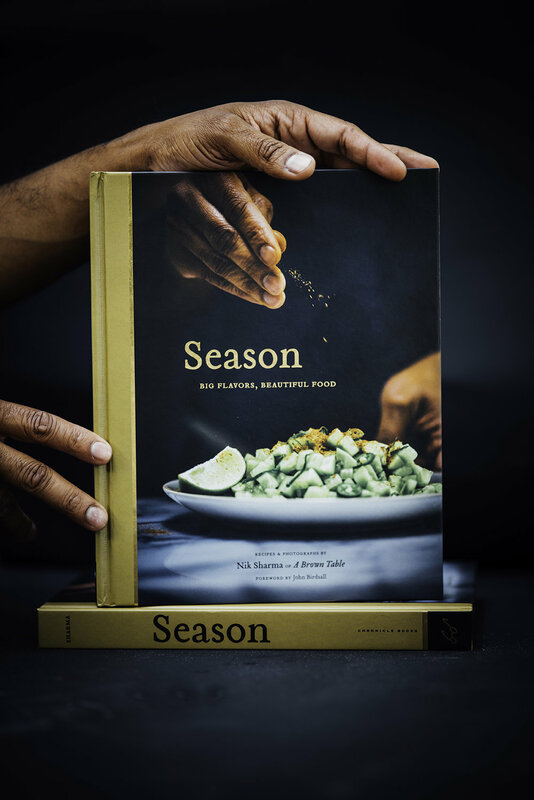 In "5 spice", "Dessert", "Thanskgiving", "pie", "sweet potato pie"